A rather twee casting is provided. I forgot to photograph it before starting to remove the large amounts of casting flash it carried. The main body is larger in diameter and considerably longer than drawing, allowing some scope for modifications if required. As drawn, the mounting flange does not match the inlet manifold. 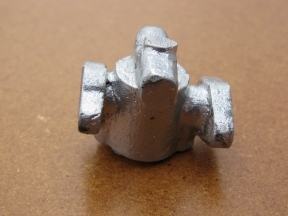 This error has been reproduced on the castings. The inlet and barrel flanges are also larger than drawing. 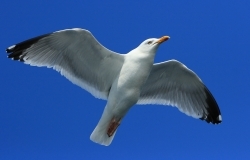 For his Seagull, Graham Meek has done some very interesting, and well written up, work on the carburettor design. I discovered these articles after I had done some of the early work on the body casting, and I am in two minds about it. On the one hand I could continue with the rather underwhelming casting and produce the carb to the original design, knowing and accepting its shortcomings as a challenge, and seeing for myself how difficult it proved to get it working. On the other hand, I have little time invested it it to date, and it might be better to start from scratch with a new design incorporating many of Graham's improvements, and with a new, fabricated body. From a cosmetic point of view, the alloy casting would take a lot of hand work to get it looking as good as the rest of the castings. In any case, a full-size engine of the era that this design represents might well have had a gunmetal carburettor. Graham Meek's alloy cube would not be in keeping with the period look I want. The revised design would involve four additional screws. It may be difficult to avoid the appearance of a porcupine. I am not very keen on making the barrel and its spindle as a single piece of brass. 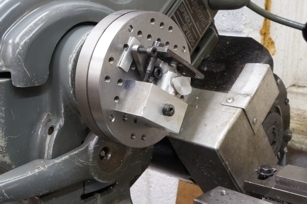 With this casting there should be enough room to have a separate steel spindle, but designing a suitable connection in the space available is tricky. This is the only casting I have done no work on yet. It will not actually be needed until much later in the build, but I like to get the castings roughed out at an early stage so that I can assess them and have time to think through any problems. 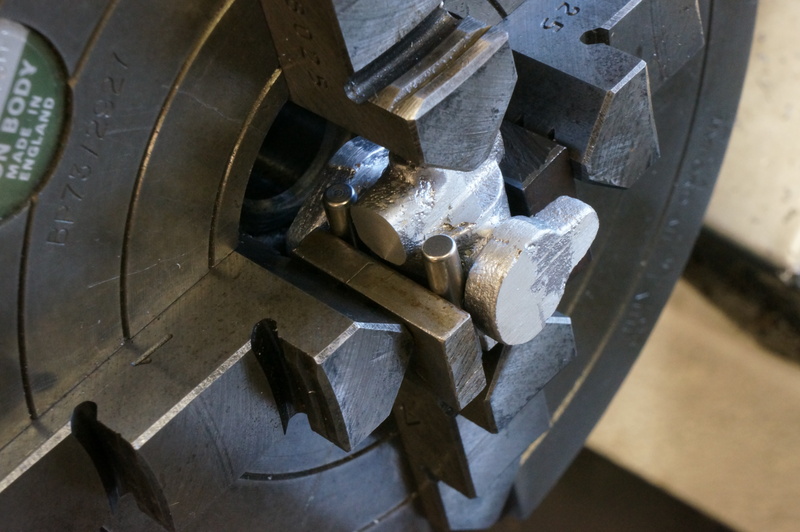 In doing some preliminary filing to allow a good set-up in the 4-jaw chuck, I found the casting to be very soft, the file was picking-up after just two strokes. The housing for the jet tube, across the back of the barrel, (uppermost in the photo of the casting above) has been cast with a discrepancy between the two halves of the mould which is going to make things awkward. I filed the ends much closer to finished size to get a better idea of what metal was available where. It looks just about doable. Starting with the front barrel flange face to get a good big datum face, this produced a poor surface finish. I tried a sharp pointed tool without a radius. That was considerably worse. Buy using a tool with a radius, a fine cut, and a slow speed (from 1020 rpm down to 425) I eventually produced a perfectly reasonable finish. 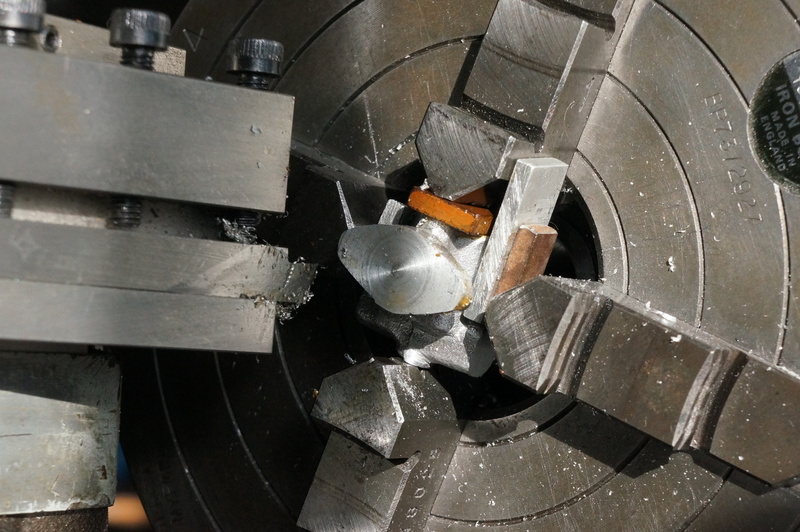 The second operation was on the bolting flange, aiming to get the jet tube housing level. 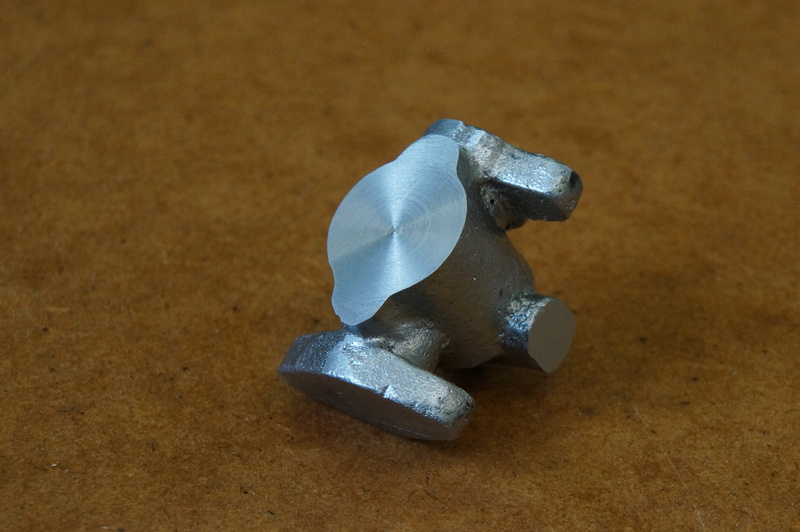 I achieved that, although the two machined faces are not dead-on square yet. The neck below this flange is oversize, which means that, unless the flange can be made longer than the design, it will be difficult to find room for the fixing nuts. Making the flange bigger on the carb body seems possible, but the Inlet Manifold does not look promising, so I decided to rough that out too for a look-see. There is not much scope. Set-up three was to machine a previously filed end face of the jet tube housing to provide a datum in the third plane, square to the front and bolting faces. Carefully examining the result, it was clear that one side of the casting is somewhere between 0.03″ and 0.05″ higher than the other, and by trying to compensate for this in facing the bolting flange I have got the vertical centreline badly skewed. The bolting and inlet flanges now look to be a problem as well as the jet tube housing. 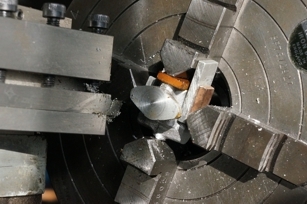 The inside faces of these flanges are also compromised by the offset in the mould. There is probably enough metal to get round it but it will not be easy. While working on the manifolds today, I decided to give the carb. bolting flange a little squeeze in the vice. It looks better, but may need a bit more. I made a squared block so that the body could be set up to have another go at the bolting flange face. 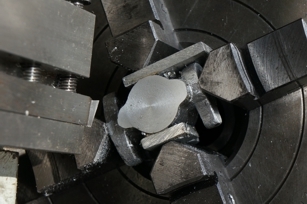 It was just possible to clamp the casting to the holey faceplate by the little lug on the inlet flange, and at the same time get bolts past to clamp the front face of the casting to the angle block. I tried two different tools to take the small amount necessary off the flange face to true it up. Both tools gave a nasty finish, and I took off more than I really wanted trying to get it better, but it looks as though the overall length and flange thickness will still be just about doable.